97% of the world's water and 71% of the planet’s surface represent sea water. This huge volume of water is, however, unfit for human consumption because of the high level of impurities present in it.This sea water can be treated and made suitable for consumption after undergoing seawater desalination treatment. At GIECL we provide an all-encompassing array of water treatment process and provisions along with seawater desalination technologies. The turnkey solutions we provide help in the optimal management of the water resources available to human kind. 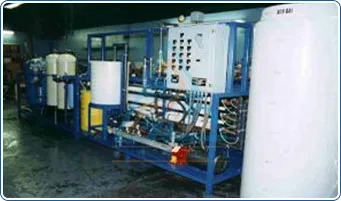 GIECL provides the most reliable and economical Sea Water Plant Solutions. With the help of finest technology and advanced machinery, the TDS & hardness of the sea water is converted into permissible parameters. Our automated sea water purification plant is capable to desalinating huge volumes of sea water within limited amount of time and power consumption. Effectivelyfresh water is extracted from sea water and hence this water becomes fit for consumption.